What Role Does Cheese Quality Play in Burrito Quality? What Makes the Ideal Burrito? Are Goat Burritos Worth Eating? What if I told you that the American burrito is all American? I know that sounds crazy, right? After all, when people think of the word “burrito,” they automatically think about sombreros. They think about cactuses. They think about deserts. Maybe an adobe church out in some sort of desert setting. They think about mariachis. Ultimately, they think about Mexico. Of course, when the concept of Mexico enters any discussion among Americans, it is too tempting for the discussion to steer towards all things ‘exotic’ about Mexico. Interestingly enough, the concept and cultural reality of Mexico is not as ‘foreign’ as many Americans care to see. After all, all of the American Southwest used to be part of Mexico. Well, there are many “ethnic” foods in the United States that are all American. They may have ethnic names. They may be served in ethnic cuisine restaurants, but make no mistake about it, they’re as American as mom and apple pie. Burritos fall into this category. What if I told you that chop suey is an American invention? What if I told you that spaghetti and meatballs is all American? Or the concept of pepperoni is actually American in origin. Sounds crazy, right? Sounds almost heretical, but it’s true. The same applies to the burrito. When a lot of people think about the burrito, they think about Mexico. They think about the great Mexican contribution to the American southwest, but really the Mexican contribution is the taco. The taco is traced back to Mexico. The burrito, on the other hand, is like Jimi Hendrix. Jimi Hendrix was all American, but he was playing blues while he was in America. Then he went to England and started playing rock guitar music and then he got big there, and because he had so many British fans, he started developing American fans so he came back here and became rock star here. In other words, he had to leave his home country just to get the respect he deserved. Amazing, right? Well, the burrito is the same. The burrito was actually invented in the United States, then it went to Mexico, and then it came back to the United States in the form of “authentic” burritos. It’s all American. I know that rubs a lot of people the wrong way, but it’s the truth. The burrito is an American invention, but Mexicans took it to a much higher level. It’s based on the taco, but it’s a self-enclosed taco. So, its culinary DNA is still Mexican but make no mistake about it, it is intrinsically American. This happens quite a bit. There’s such a thing as cultural fluidity when it comes to the food we eat. Food is a reflection of culture, and it’s also a reflection of the flows of people, languages, economies and political boundaries. If you need proof of this, look at the origin of pizza.it would really blow your mind because pizza is not actually Italian. It’s actually North African, from Tangiers, Tunisia, Algeria or thereabouts. The word “pizza” is actually an Italian adaptation of the word “pita.” Pita, of course is pita bread. Burritophile.com makes no bones about it. We're all about burritos. 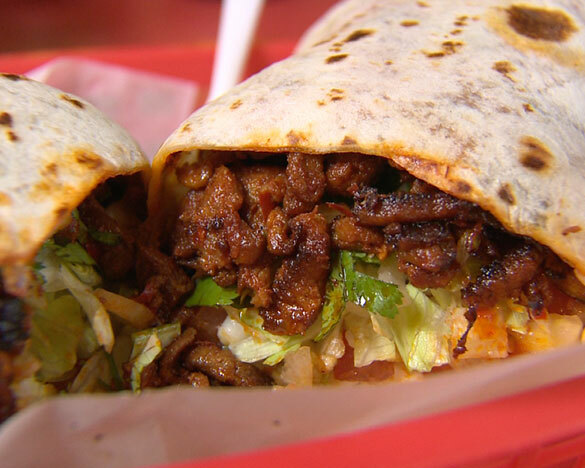 If you think you've come up with the best burrito in the planet, bring it here.